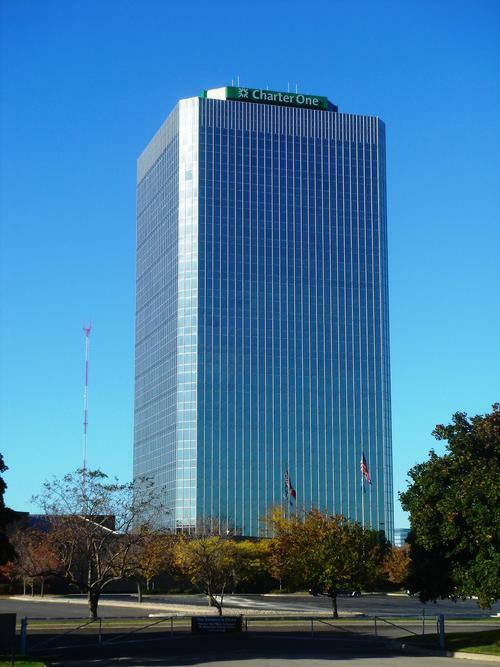 The American Center is a high-rise tower in the Metro Detroit suburb of Southfield, Michigan. It was built in 1975 and stands at 26 stories, with one basement level, for a total of 27 floors. The building's main use is that of a typical office tower. It also includes a parking garage and retail spaces. As with many modern architecture-based towers, it exterior is laden with golden glass. The tower was originally built as the home for the American Motors Corporation; the company was later bought by the Chrysler Corporation and then bought by Charter One. The tower is square in plan, with chamfered corners. The elevator core is unusual in that it is rotated 45 degrees relative to the tower's axis. The building is located close to Interstate 696, M-10, and US 24, "Mixing Bowl." The American Center is separate from the nearby Southfield Town Center.